Here is one more for your Health – delicious Raspberry! Wishing you all very Happy and Healthy New Year!!! Apart from being rich in vitamins and fibre, raspberry is a delicious fruit with various health benefits. It contains a high concentration of ellagic acid which prevents cancer and stops the growth of cancer cells. Furthermore, it helps to lose weight and also has anti-ageing properties. Raspberry is easy to include in your diet. You can either include it in some recipes, eat it raw, or add to drinks. Here are six reasons raspberry is good for your health. 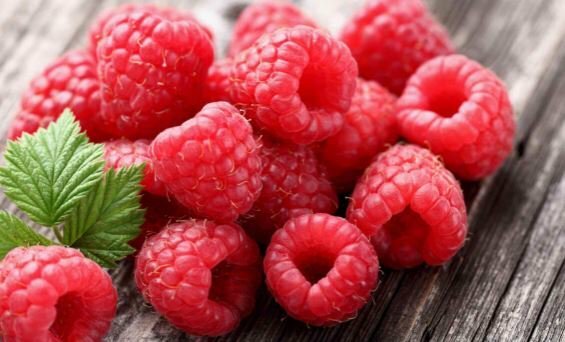 If you are looking for a delicious and effective way to lose weight, raspberry can be the best natural option. Raspberry contains fibre which aids in slowing down the digestive process, keeps your metabolic rate high, and thereby burns fat. I hope that black raspberries have the same health values … we can grow the black ones here in FL, not the pretty red ones. They grow wild by me. Google Rubus occidentalis – that’s the main species, but I’m not sure which particular sub-species we have – my husband brought the plant home about 4 years ago. Knowing him, he traded plants with someone. Black raspberries are some of the most delicious berries on the planet. I agree that they are delicious, but they are treacherous to weed…. actually it seems like the majority of our fruit have thorns, so weeding is usually a challenge. yes both has same benefit but we can saw red one is more health values . Alas, it’s too warm here for the red variety. No doubt that raspberries, red or black are super healthy. As one approaching a milestone age I never dreamed I would, I advise men, especially to use the berries rather than pills to control hypertension, weight gain, vision or any prostate issues. Major Props on writing this! Happy New Year! Let me just say that I am glad they serve a good purpose because I love them! Thank you for stopping by my blog, commenting and clicking Like over the years. Happy New Year! !…may the new year bring you all that you wish for!!!.. I never thought that raspberries had so many benefits. I always thought that it was just a really good product to make tasty tinted lip gloss lol. Thanks for your insights. Raspberries is my all time favourite fruit. They are so delicious! So happy they have benefits as well. Yum!! 😋 Its a shame I can’t eat them. Yummy!! I love to have more raspberries after this. Black Raspberries are so delicious! And I love to eat them more and more. Omg I’d only everyone could read this! Berries are one of my favorites, especially red rasberries. I love raspberries and include them in my diet daily. Thanks for sharing. Awesome post! I put raspberries in my oatmeal every morning!